Astarte (Greek: Ἀστάρτη, Astártē) is the Hellenized form of the Middle Eastern goddess Astoreth (Northwest Semitic), a form of Ishtar (East Semitic), worshipped from the Bronze Age through classical antiquity. The name is particularly associated with her worship in the ancient Levant among the Canaanites and Phoenicians. She was also celebrated in Egypt following the importation of Levantine cults there. The name Astarte is sometimes also applied to her cults in Mesopotamian cultures like Assyria and Babylonia. Astarte is one of a number of names associated with the chief goddess or female divinity of those peoples. She is recorded in Akkadian as As-dar-tu (𒀭𒊍𒁯𒌓D), the masculine form of Ishtar. 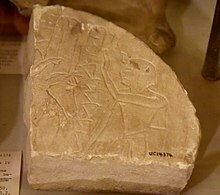 The name appears in Ugaritic as ʻAthtart or ʻAṯtart (𐎓𐎘𐎚𐎗𐎚), in Phoenician as ʻAshtart or ʻAštart (𐤏𐤔𐤕𐤓𐤕), in Hebrew as Ashtoret (עשתרת). The Hebrews also referred to the Ashtarot or "Astartes" in the plural. The Etruscan Pyrgi Tablets record the name Uni-Astre (𐌖𐌍𐌉 𐌀𐌔𐌕𐌛𐌄). Astarte was connected with fertility, sexuality, and war. Her symbols were the lion, the horse, the sphinx, the dove, and a star within a circle indicating the planet Venus. Pictorial representations often show her naked. She has been known as the deified morning and/or evening star. The deity takes on many names and forms among different cultures and according to Canaanite mythology, is one and the same as the Assyro-Babylonian goddess Ištar, taken from the third millennium BC Sumerian goddess Inanna, the first primordial goddess of the planet Venus. Inanna was also known by the Aramaic people as the god Attar, whose myth was construed in a different manner by the people of Greece to align with their own cultural myths and legends, when the Canaanite merchants took the First papyrus from Byblos (the Phoenician city of Gebal) to Greece sometime before the 8th century by a Phoenician called Cadmus the first King of Thebes. Other centers were Cythera, Malta, and Eryx in Sicily from which she became known to the Romans as Venus Erycina. A bilingual inscription on the Pyrgi Tablets dating to about 500 BC found near Caere in Etruria equates Astarte with Etruscan Uni-Astre, that is, Juno. At Carthage Astarte was worshipped alongside the goddess Tanit. In the description of the Phoenician pantheon ascribed to Sanchuniathon, Astarte appears as a daughter of Epigeius, "sky" (anc. Greek: Οὐρανός ouranos/ Uranus; Roman god: Caelus) and Ge (Earth), and sister of the god Elus. After Elus overthrows and banishes his father Epigeius, as some kind of trick Epigeius sends Elus his "virgin daughter" Astarte along with her sisters Asherah and the goddess who will later be called Ba`alat Gebal, "the Lady of Byblos". It seems that this trick does not work, as all three become wives of their brother Elus. 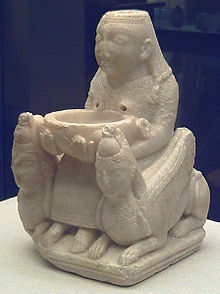 Astarte bears Elus children who appear under Greek names as seven daughters called the Titanides or Artemides and two sons named Pothos "Longing" (as in πόθος, lust) and Eros "Desire". Later with Elus' consent, Astarte and Hadad reign over the land together. Astarte puts the head of a bull on her own head to symbolize Her sovereignty. Wandering through the world, Astarte takes up a star that has fallen from the sky (a meteorite) and consecrates it at Tyre. Ashtoreth is mentioned in the Hebrew Bible as a foreign, non-Judahite goddess, the principal goddess of the Sidonians or Phoenicians, representing the productive power of nature. It is generally accepted that the Masoretic "vowel pointing" adopted c. 135 AD, indicating the pronunciation ʻAštōreṯ ("Ashtoreth," "Ashtoret") is a deliberate distortion of "Ashtart", and that this is probably because the two last syllables have been pointed with the vowels belonging to bōšeṯ, ("bosheth," abomination), to indicate that that word should be substituted when reading. The plural form is pointed ʻAštārōṯ ("Ashtaroth"). The biblical Ashtoreth should not be confused with the goddess Asherah, the form of the names being quite distinct, and both appearing quite distinctly in the First Book of Kings. (In Biblical Hebrew, as in other older Semitic languages, Asherah begins with an aleph or glottal stop consonant א, while ʻAshtoreth begins with an ʻayin or voiced pharyngeal consonant ע, indicating the lack of any plausible etymological connection between the two names.) The biblical writers may, however, have conflated some attributes and titles of the two, as seems to have occurred throughout the 1st millennium Levant. For instance, the title "Queen of heaven" as mentioned in Jeremiah has been connected with both (in later Jewish mythology, she became a female demon of lust; for what seems to be the use of the Hebrew plural form ʻAštārōṯ in this sense, see Astaroth). Some scholars claim that the cult of the Minoan snake goddess who is identified with Ariadne (the "utterly pure") was similar to the cult of Astarte. Her cult as Aphrodite was transmitted to Cythera and then to Greece. Herodotus wrote that the religious community of Aphrodite originated in Phoenicia and came to Greeks from there. He also wrote about the world's largest temple of Aphrodite, in one of the Phoenician cities. Her name is the second name in an energy chant sometimes used in Wicca: "Isis, Astarte, Diana, Hecate, Demeter, Kali, Inanna." ^ a b c K. van der Toorn, Bob Becking, Pieter Willem van der Horst, Dictionary of Deities and Demons in the Bible, p. 109-10. ^ Budin, Stephanie L. (2004). "A Reconsideration of the Aphrodite-Ashtart Syncretism". Numen. 51 (2): 95–145. ^ Raphael Patai. The Hebrew Goddess. (Wayne State University Press 1990). ISBN 0-8143-2271-9 p. 57. ^ Jeffrey Burton Russell. The Devil: Perceptions of Evil from Antiquity to Primitive Christianity. (Cornell University Press 1977). ISBN 0-8014-9409-5 p. 94. ^ Markoe, Glenn (2000-01-01). Phoenicians. pp. 123–124. ISBN 978-0520226142. ^ Day, John (2002-12-01). John Day, "Yahweh and the gods and goddesses of Canaan", p.128. ISBN 9780826468307. Retrieved 2014-04-25. ^ Smith, Mark S. (2002-08-03). Mark S. Smith, "The early history of God", p.129. ISBN 9780802839725. Retrieved 2014-04-25. ^ Barry B. Powell. Classical Myth with new translation of ancient texts by H. M. Howe. Upper Saddle River. New Jersey. Prentice Hall Inc. 1998. p. 368. ^ R. Wunderlich. The Secret of Creta. Efstathiadis Group. Athens 1987. p. 134.